Welcome to all of you in my blog, this post is all about basic blockchain and how it works actually. I came across lots of blogs (not in sap) where people discussed lots about blockchain, the funny one was ‘how i explained blockchain to my grandma’. But i always wonder what it means to developer like me, how can we implement blockchain from scratch no more api’s lets build everything from scratch. Before jumping into code i would like to explain some core technical concept which is very important. A distributed database that maintains a continuously growing list (Blocks) of ordered which can be read by anyone. Nothing special, but they have an interesting property means to add any block into blockchain block has to satisfy some property: they are immutable. 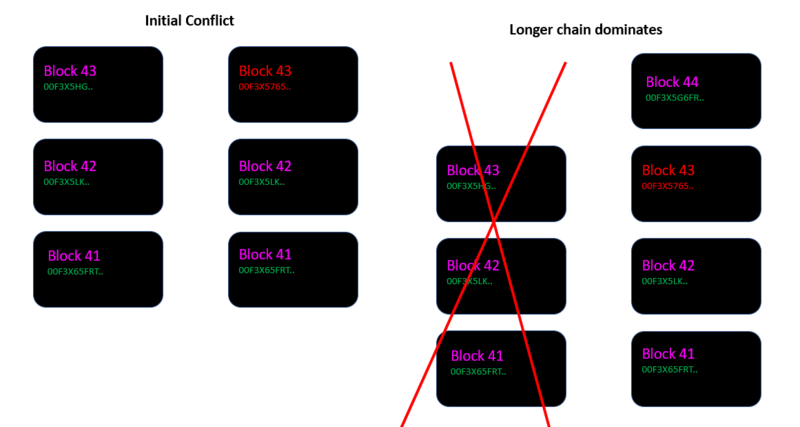 Once a block has been added to the chain, it cannot be changed anymore without invalidating the rest of the chain. And this is one of the reason why all cryptocurrencies are like Bitcoin ,Ethereum, Litecoin etc are based on blockchain. Because no one want to change their previous transaction which they have already made. As a blockchain developer first most important task is to decide structure of block. In our example we will keep it very simple and which are most necessary component: index, timestamp, data, hash and previous hash. Now all components are self explanatory . Index is nothing but Block index , Timestamp means committed time for that particular when it got added to blockchain, hash is SHA256 Hash value for that particular block , Previous hash is SHA256 Hash value for Previous Block. The hash of the previous block should be present in the block to form a valid chain or preserve the integrity . Genesis block is nothing but first block in blockchain , it is basically dummy block to start the blockchain , in Bitcoin Blockchain the value of genesis block is 0. Mostly software developer hard code it to utilize the blockchain. To keep the integrity of blockchain all Block need to be hashed in SHA256. Those who are not familiar with SHA256 Hash , its encryption function like MD5 and SHA1 and once you encrypt any plain text using this , there is no chance to get it back in normal form. To add a block in blockchain we should know the hash of the previous block and create the rest of the required content (= index, hash, data and timestamp). Block data will be provided by end user . Lets Look at the stuff , which makes actual sense for developers . I have used Sap Cloud Platform Developer (trial) account and used MDC Hana trial to build whole demo . 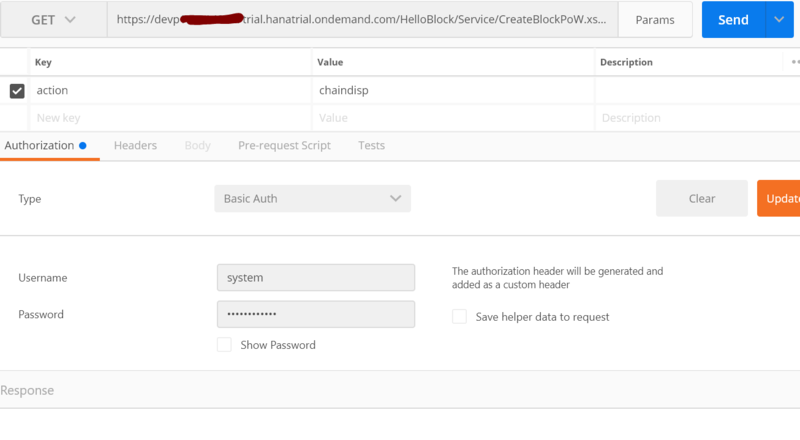 If you haven’t used MDC hana trial in your Sap Cloud Platform trial account Please have look at MDC trial Setup in SCP. Sap tutorial provides cool guide for that . 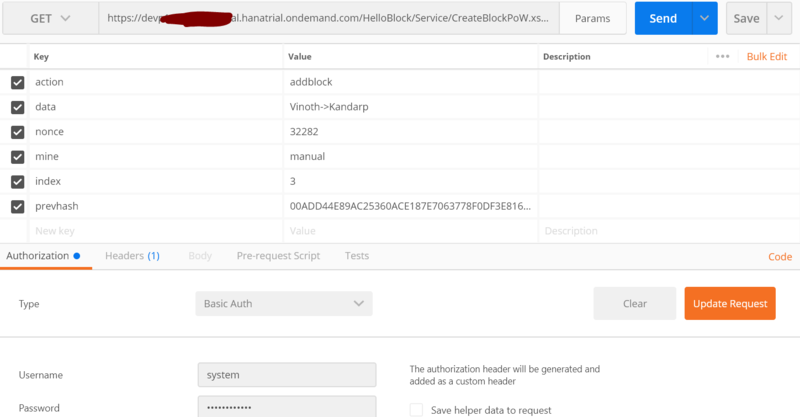 First i have defined a schema called “HELLOBLOCK”. My design time artifact or schema.hdbschema file look like . Then i have created a column table called Blockchain with all necessary fields . My entity.hdbdd look like . I have created a simple procedure to insert entry in blockchain table which will be called from xsjs based on validation of block . 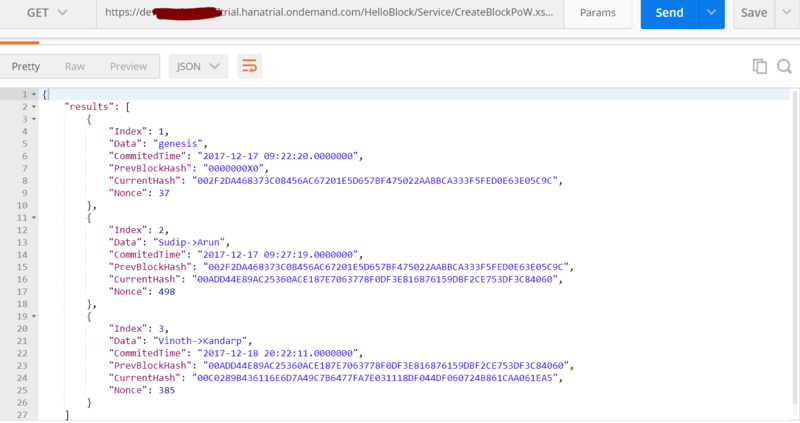 Hana xsjs service to add block in blockchain . Lets understand each function in more details. function CalculateHash(s) : This function takes plain text as input and gives SHA256 hash of it as output. When calling this function you have to pass text/string as argument in return this function will give you SHA256 form of it. Refference for this funtction can be found in SHA256 Webtoolkit. function ValidCall() : This function basically checks all the input parameter for this xsjs, if you dont pass all parameter it will not allow you to go further . 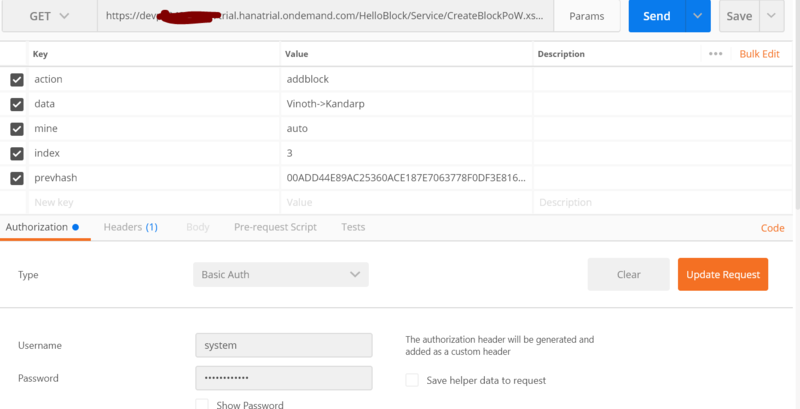 As you can see to test this service you have to pass action , data , index and prevhash parameter without passing all this parameter it will not call function AddBlock(), which is mainly responsible for further validation and adding block and blockchain . I will come to this function later on to get deep drive. function CurrentTImeStamp() : This function returns current timestamp . 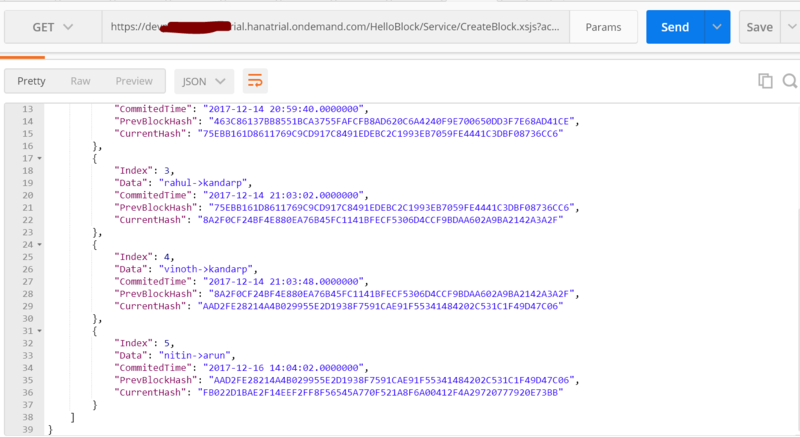 function DisplayBlockchain() : This function returns all blocks / records in JSON format by selecting Data from Blockchain table . 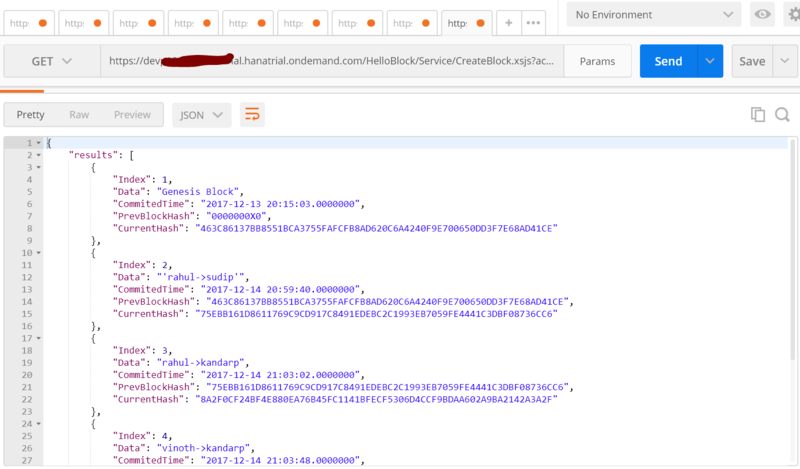 function AddBlock(): In this function we have defined our main logic and validation .It checks passing index and previous block hash is correct or not based on that it calculate hash of current block and call the procedure to insert data into table and call function DisplayBlockchain() to display whole chain in JSON format. If anything goes wrong it will throw an error. Now Lets go with testing , first i will display the whole Blockchain then i will try to add Block in blockchain and try to manipulate some block also. We will go with Classic Postman . After hitting the send button , we can see Block 6 just got added. Now you got an idea Previous block hash plays a major role , if you try to manipulate one block data then hash for that block will get changed and all next block will be in entire chain will be invalid. At the same time if you understood it correctly , many of you have question already that , if any one can pass previous block hash and correct index then He/She will be able to add Block in Blockchain and spam it like anything .You are right this block is not secure and spamming in the block is possible. Lets Secure it , so no one can spam . As Blockchain works on Peer-to-Peer network ,it works based on choosing the longest chain rules. choosing the longest chain – There should always be only one explicit set of blocks in the chain at a given time. In case of conflicts (e.g. two nodes both generate block number 72) we choose the chain that has the longest number of blocks. Right now creating block is so easy and quickly and it leads to 3 different problem. First : People can add blocks incredibly fast and spam our blockchain. A flood of blocks would overload our blockchain and would make it unusable. And thirdly, As blockchain works in P2P network , now you can combine this two problem to take control over whole blockchain. Blockchains are powered by a peer-to-peer network in which the nodes will add blocks to the longest chain available. So you can tamper with a block, recalculate all the other blocks and then add as many blocks as you want. You will then end up with the longest chain and all the peers will accept it and start adding their own blocks to it. Proof-of-work is a mechanism that existed before the first blockchain was created. It’s a simple technique that prevents abuse by requiring a certain amount of computing work. That amount of work is key to prevent spam and tampering. Spamming is no longer worth it if it requires a lot of computing power. Bitcoin implements proof-of-work by requiring that the hash of a block starts with a specific number of zero’s. This is also called the difficulty. Based on total number of block in blockchain it get increase. But hang on a minute! How can the hash of a block change? In case of Bitcoin a block contains details about a financial transaction. We sure don’t want to mess with that data just to get a correct hash! To fix this problem, blockchains add a nonce value. This is a number that gets incremented until a good hash is found. And because you cannot predict the output of a hash function, you simply have to try a lot of combinations before you get a hash that satisfies the difficulty. Looking for a valid hash (to create a new block) is also called “mining” in the cryptoworld. In case of Bitcoin, the proof-of-work mechanism ensures that only 1 block can be added every 10 minutes. You can imagine spammers having a hard time to fool the network if they need so much compute power just to create a new block, let alone tamper with the entire chain. lets Look at our new Block Structure , I added one more field in table Nonce . This Time i have introduced one new function MineBlock , It takes difficulty ,index,data,timestamp and initial hash of block with nonce 0. and it calculates the good hash with valid nonce and give it return back. Little Modification in function AddBlock() and ValidCall() . First we look at validcall() then we will move to AddBlock(). This time i have introduced two more parameter nonce and mine . Mine has two mode auto and manual , if you just want to test it and dont want to pass nonce you can choose auto and if you want to pass nonce then mine parameter should be manual . ValidCall() basically validates your input parameter and based on proper input it will call AddBlock(). This time it takes one parameter extra that is nonce , in case of if you pass parameter mine as auto in xsjs service call it auto will be passed as nonce . 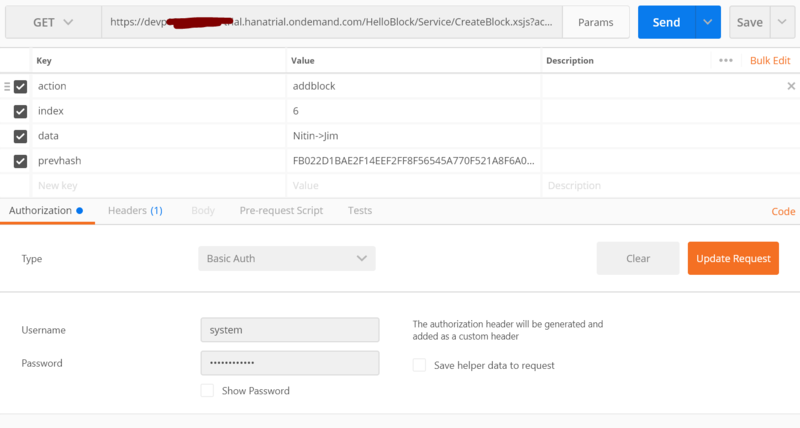 in case of auto nonce it will first initialize the nonce as 0 and check the difficulty based on the formula we have defined and call MineBlock() , it will get valid hash and nonce and add the block as simple as that , please noted that in real blockchain you can’t send mine parameter as auto , here just for testing and finding nonce is difficult i have made it . In real blockchain to mine a block you have to find Nonce by utilizing your computation power. In case if you send mine parameter as manual then you have to pass nonce parameter and which will be checked with valid nonce , if its same then it will allow you to add a block in blockchain. Now you can see how secure it is , because finding nonce when difficulty level is ultra legend task. Lets putting everything together. lets test it with classic postman. Now you can see the Pattern of hash , and it returned Nonce. Lets try to add one block using random nonce. Look at the response . Now we will try to add block automatically to see what is the valid hash and nonce for this block. Block got added with valid nonce 385 , in my example to keep it simple i defined easy difficulty but in real use case it will be too complex and hard. The Whole Project (HelloBlock) is available On Github. You can import it as delivery unit also in that case you have to assign role to your user to execute it. I hope you like this blog , new idea ,suggestions are always welcome. 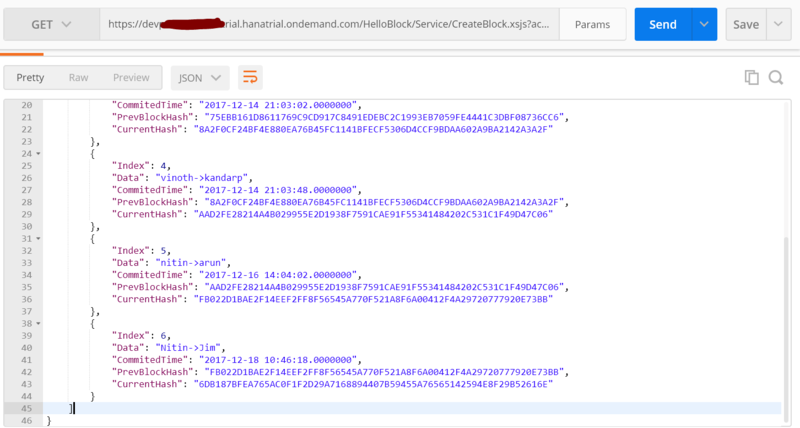 In next Blog we will see how we can build end to end Blockchain application on supply chain use case using SAP Cloud Platform. Just as before a quick warning: This implementation is intended to show only how Blockchain works internally ,It still lacks many features (like a P2P network). Thanks for sharing such a nice document with step by step explanation . It is very interesting blog with end to end explanation. Thanks for sharing the detailed information. Thank you for this christmas present. Very interesting.. Explaination is good, can easily understand basics of block chain. For example, you can create a blockchain which is read-only to the end-user. Only administrators can add blocks. This is used in applications such as centralised government online identification, You go down to your local government offices with your paper identity and they create you an online identity that is part of their blockchain. You can’t add it yourself. Only authorised people can. Anyone can interrogate the blockchain (read-only access) and prove that your online identity is part of the blockchain, and therefore you are who you say you are. the original blog and its underlying thread seem a bit dated but i think you are correct, blockchains can also be centralized and permissioned, in addition to being as originally ‘designed’ to be both decentralized and permissionless. enterprise software, whose revenue relies on licensing, is clearly an application of the former rather than the latter. hoping to hear more about blockchain during this TechEd season. To be fair, in his next blog he does talk about non-distributed block chain.